Local Transportation – Explore Azumino! For those wishing to travel around the Azumino countryside, there are several options available to visitors. Local trains running along the Oito Line connect the Azumino area to Matsumoto, a major city that acts as a central hub for most travel in and around Nagano prefecture. Train stations throughout Azumino are typically no longer than 30 minutes away from Matsumoto City and are easy and affordable to use. 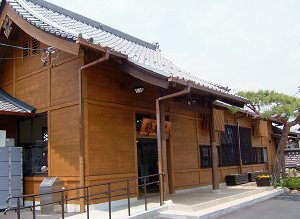 Although many of the attractions in Azumino are within easy walking distance of its train stations, it is recommended that visitors rent bicycles or hire taxis in order to reach some the area’s further-to-reach destinations such as the Azumino National Park, the Daiõ Wasabi Farm and some of the museums running along the Azumino Art Line. 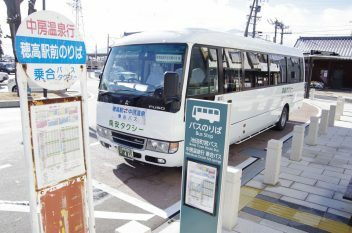 For transportation to Nakabuse Onsen, visitors may wish to take the Nakabusa Line bus, a service that runs from Hotaka Station throughout the day during the summer and autumn months. 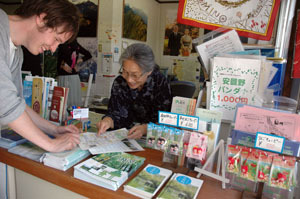 Also, a limited season bus tour of the Azumino area operates during late April to early November. Details of all these respective services may be found below. Please be sure to be in possession of a valid international driving license when driving in Japan. Drivers should also note that vehicles drive on the left-hand side of the road in Japan. 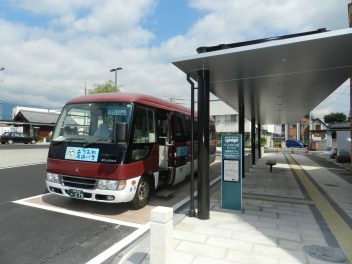 Cars can be hired from Green Auto at Aida (Mitsubishi) Gas Station, which is 3 min north from Hotaka Station on foot. Visitors should reserve cars two days in advance of their traveling needs. Three taxi companies operate in the Azumino area and run services from Azusabashi, Hitoichiba, Toyoshina, Hakuyacho, Hotaka, and Ariake stations (spanning the local Oito Line), from early morning till late evening. Azumino–Hotaka Seasonal Excursion Bus (Tour Bus)Golden Week, July–Early Nov.
Azumino City runs a dedicated tourist office throughout the year outside Hotaka Station. See here for more information.